SURELY there’s been some mistake here. I was told to drive the new facelifted Astra, but this one is clearly the same as the model released in 2004. What’s that you say? It’s got revised front and rear light lenses, front bumper and extra chrome detailing on the grille? Ah yes, how could I miss them? OK, so the visual changes to Vauxhall’s lower-medium model are hardly dramatic. The interior has had the briefest of surgical procedures, with new detailing in either piano black or matt chrome over the centre console and steering wheel. The detailing – piano black on our test car – seems to divide opinion. I think it looks rather smart, especially as Vauxhall has cunningly managed to make it impervious to dirty fingerprints. 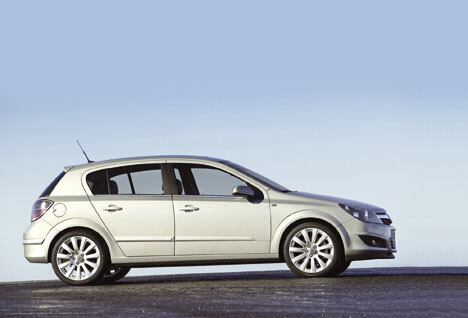 However, the passengers who experienced the Astra during its few days at Fleet News were less impressed. You can’t please ’em all. But while the cosmetic tweaks are worth a mention, it’s the work under the bonnet that deserves the most coverage. For those wanting performance a new 178bhp, 1.6-litre turbocharged petrol engine replaces the old 168bhp 2.0-litre unit and provides reduced emissions and better performance. But even more fleet-friendly is the revised 1.6 Twinport petrol unit. Where the old unit wheezed out 104bhp, the new engine packs 114bhp but with better fuel efficiency and reduced CO2 emissions. Expect a combined fuel economy figure of 43.5mpg – an increase of 4% over the engine’s predecessor – and emissions of 156g/km, down from 158g/km. The benefits are best shown in the estate version with the same engine – emissions are down from 166g/km to 158g/km, which means a reduction of up to £25 in road tax and a benefit-in-kind tax saving of £109 a year for a 22% tax payer. But it’s the five-door hatchback we’re testing, and while the financial pros are not as considerable as the estate, things are still improved. Acceleration is quicker – the new engine now hits 60mph from standstill in 10.9 seconds, an improvement of 0.6 seconds. The tweaks are appreciated. The new unit is smooth and at the top end has enough power for overtaking or joining a motorway without having to work it too much. But how does it compare to the more traditional fleet fare – the diesel? Vauxhall sees the new petrol engine as offering another option to diesel drivers, and the closest match in the Astra range is the 99bhp 1.7 CDTi. Although it boasts 177lb-ft of torque compared to the petrol version’s 114, the diesel can only manage 11.5 seconds to 60mph. It does flaunt its 55.4 combined mpg, but in the Design spec we tested it costs £16,685 against £15,400 for the similarly-specced petrol. Over a three-year/60,000-mile fleet life, both will retain 29% of their value according to CAP, so the petrol will offer fleet managers less cash lost. The clincher is company car tax. Both versions fall into the 18% tax bracket, which means a 22% taxpayer will pay less for the cheaper petrol car – £603 a year versus £655. Those sums make the new 1.6 Twinport a serious fleet contender. IF you’re looking for the cheapest car, take a good look at the Volkswagen before you head for the Ford. The Golf is only £40 more than the Focus and offers more standard equipment. Of the Vauxhalls the diesel is more expensive than its same spec petrol cousin. THE Ford and the Volkswagen cost the least to tax. The Vauxhalls have lower emissions but all four fall into the same tax bracket, so the cheaper cars bring the smallest BIK bills. The Focus and Golf cost £49 a month for a 22% taxpayer, while the Astra petrol is £50 and the diesel £55. WITH the smallest wheels of the line-up – 15-inch – the Golf comes out cheaper by a fraction thanks to lower tyre costs but the petrol Astra is not far behind, being by far the cheapest to service. There’s not much to choose between the diesel Astra and the Focus. UNSURPRISINGLY, diesel power is all-conquering here. The Astra’s CDTi engine returns 55.4mpg, streets ahead of the petrol rivals. Of those, the other Astra is the most frugal with economy of 43.5mpg against the Focus with 42.8mpg and the Golf’s 42.2mpg. THE strength of the Volkswagen badge pushes the Golf far ahead in residual value terms. CAP reckons that after three years/60,000 miles the Golf will retain 41% of its value. The Focus is a distant second, retaining 30%, while both Astras will hold on to 29%. THE Volkswagen is by far the cheapest to run over a three-year/ 60,000-mile fleet life. Cheap at the front-end, strong residuals and the cheapest SMR costs put it well ahead of the rest. The Ford and Vauxhalls are similar – good fuel economy can’t make up for low RVs. THE only real choice here is the Golf. Although the petrol Astra proves a worthy alternative to its diesel sibling on the road and in financial terms, both Vauxhalls are outperformed by the Volkswagen. The German car is a solid all-rounder that won’t break the bank during its fleet life and will fetch a good price when its stay is at an end. is the astra 1.6 16valve petrol engine, belt driven or chain driven ?